So, the other day Jake Buckler asks me about Wi-Fi extenders for RVs. It seems he lurks around in some of those RV facebook groups. Whatever, personally I think that boy has some problems but if that’s what makes him happy I can think of a lot worse things. So, let’s take a look at this whole concept and why this might (or might not) be something you want to invest in. A Wi-Fi extender is an inexpensive device that’s designed to bring Wi-Fi into areas that don’t have good connection speeds. 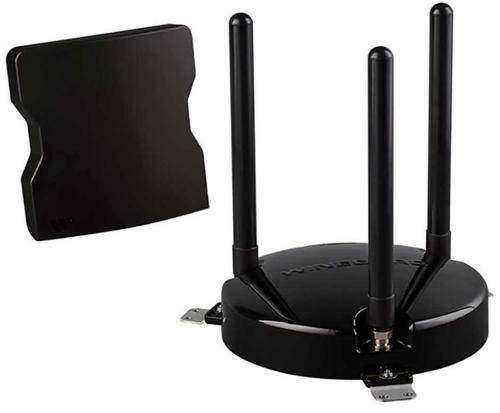 It receives the Wi-Fi signal from your router and rebroadcasts it on a new Wi-Fi network. You have the option to connect to the original network or the new network created by the extender, which should be a lot stronger. The good thing about this solution is it’s usually inexpensive and easy to set up. The bad thing is that you have two different Wi-Fi networks and the “extended one” is usually slower to respond. Would you need a Wi-Fi Extender in an RV? Well, that’s a little harder to figure out. Let’s look at it point by point, and maybe by the end even Buckler will get it. Where’s the Wi-Fi coming from? If you’re driving down the road, it’s not clear where you would get Wi-Fi from. So obviously a Wi-Fi extender isn’t going to help you while driving because you’re not going to be in the range of any stationary Wi-Fi source for more than a few seconds. What if you’re parked outside a Starbucks? Well first of all the free Wi-Fi is only for patrons so unless everyone in the RV is getting caffeinated, shame on you. But ok, let’s say you’re mooching off Starbucks for a bit. I would think that one end of the RV was able to get a good Wi-Fi signal, that the other end would too. so, there’s no need for a Wi-Fi extender. OK, what if you’re parked in an RV park and the RV park has free Wi-Fi, but it doesn’t quite reach to your RV? My thought here is, either it reaches or it doesn’t. I mean, again if you get Wi-Fi in one part of the RV you’re going to get it everywhere, so there’s no need for an extender. I suppose, if you had a friend who was under 100 feet away and that person got Wi-Fi and you didn’t, they could set up an extender for you to use. I suppose that’s possible. The image at the top of this article is Winegard’s ConnecT WF1 device. If you really do run into situations where the RV park’s free Wi-Fi isn’t reaching you, this might help. It’s a permanently installed device that mounts on the RV’s roof and extends the signal into the RV itself. The theory here is that by putting large antennas on your roof, you might just be able to get a Wi-Fi signal that you couldn’t get on your phone inside the RV. That’s very possible, since that’s the same theory that makes cell boosters work. I should mention that if you look at that part, it’s not the cheapest thing in the world and it does require a permanent installation that is very likely to result in you drilling holes in your RV, and it’s not guaranteed to work in every situation. But hey, if it’s something you’re willing to use, I think that’s great. Personally I think a better way of looking at this situation is to realize that pretty much everything you use while in your RV has a cellular connection as well. Something like the weBoost Drive 4G-X might be a better choice if you have an unlimited data plan, or if the stuff you want to stream doesn’t count against your data. For example if you have AT&T, then DIRECTV NOW doesn’t count against your data. If you need a Wi-Fi connection, most cell phones can be used as personal hotspots so a PC or other device can connect to it over Wi-Fi. Personally I doubt it, but maybe this article might give everyone else an idea what to look for to get a great connection to your RV.